Bake, boil or steam a meal for eight people, (4x more food than the speedier GoSun Sport) using only the sun. Temporarily out of stock. Second half of April new Grills will arrive in Europe again. Pre-orders can be made. Just open and relax. No empty tanks to replace or burnt carbon crud to scrape. No fire hazard here. Just load your food and let the Sun do the cooking! Simple to use, cool to touch and large enough to feed eight, the Grill was designed with the family in mind. The Grill is designed to be preheated before use. Even overcast skies can build into a heated chamber ready to cook. Once heated, medium and large dishes will require at least partial Sun to continue cooking. Many foods will finish cooking when the internal temperature of the food hits near 100°C. This means that steam is a strong indicator of a dish's progress. Noticing smell is another easy and surprisingly intuitive way to judging your food's progress. Give it a couple tries and you'll be a pro. 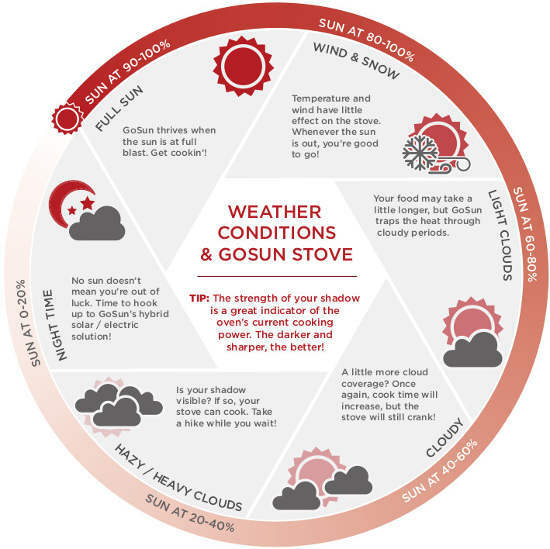 The GoSun Grill comes with a Two-Year, "No-Questions-Asked" Warranty on the vacuum cooking chamber. This cooking tube is made of borosilicate glass, and is extremely durable, much like other common forms of Pyrex ® cookware. If you have any troubles, we will send you a replacement tube FREE of charge to anywhere in the world... we just ask that you pay the associated shipping costs.